Classic Chocolate Chip Cookies - Every home baker needs a good classic chocolate chip cookie recipe in her repertoire. It has to be the kind of recipe that you can make on any given weekday afternoon, whether for the family, the whole soccer team, or just for yourself. 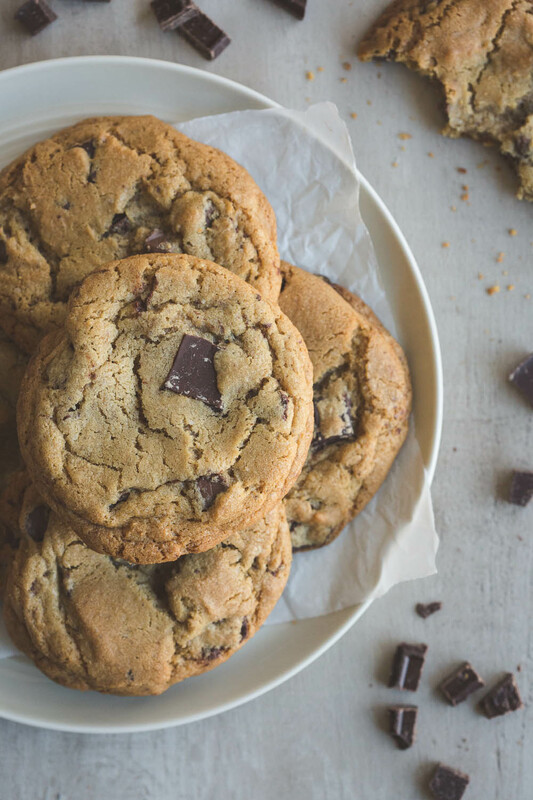 For me, the classic cookie I crave is soft in the middle, crispy on the edges, full of chocolate, and flavorful through and through. I've been perfecting my recipe for as long as I have been baking, which is a long time. I have tried countless recipes, tweaking elements here and there to get the result I was after. My current go-to recipe is a combination of several of my favorites including these, from Jacques Torres found on Martha Stewart, these from Whipperberry, and these from the New York Times. The keys to this recipe are to use both semisweet and milk chocolate, so that you get a bit of caramel undertone in the cookie, add at least two teaspoons of good vanilla, use a full teaspoon of salt, use a little cornstarch if you aren't going to eat them immediately after baking, make them large for best texture, and, most importantly, let the dough rest in the fridge for a minimum of 24 hours before baking. If you can't wait 24, try to wait for at least 3. This lets the flour fully absorb the fat in the butter and gives the flavors a chance to come together and ripen. Though I like to make these cookies big, they work well in a small size if you need to feed a crowd, or just don't want to make large cookies. Cream together softened (not melted) butter and sugars. Add eggs, one at a time, beat to incorporate. Add vanilla and beat until well-combined and fluffy. Measure all dry ingredients, except chocolate, and add to the bowl. Mix slowly until thoroughly combined, but don't over mix. Add milk and dark chocolate to the dough and mix until evenly distributed. Store dough, tightly sealed in plastic or parchment, in refrigerator for at least 24 hours. This dough gets better with age, so the longer the better. It will keep for up to a week, or more, in the fridge. When ready to bake, heat oven to 350⁰ and if you have a convection option, I recommend using it. These cookies have the best texture if they are made large, the size of a large cookie scoop or ice cream scoop, but small cookies work well too. I use a scoop to portion the dough so I have similarly-sized cookies. You can also roll the dough into a log before placing in the refrigerator for slice and bake ease. Place balls of cookie dough (roll them slightly if they are not shaped well) onto ungreased cookie sheet. Large cookies will bake for 13-14 minutes, small for 9-10. They should be turning golden brown on the edges but still very soft, under-baked, in the centers. The tops should be browning and set, not raw, but still soft. The cookies will continue to bake and set for a few minutes when they are out of the oven, so it is best to pull them out while under-baked and a bit puffy or they will turn hard and lose their chewy center. Leave them to cool on their pan for about 5 minutes before placing on a cooling rack. These cookies are best eaten fresh but will keep in an airtight container for two to three days. The cornstarch in the dough will help them to maintain their soft, chewy interior if you don’t plan to eat them right away. I like to make this dough and keep it in the refrigerator to have on hand so I can bake up a few cookies at a time. You can also portion out the dough and freeze it so you can take cookie dough balls out of the freezer and bake them up at any time.